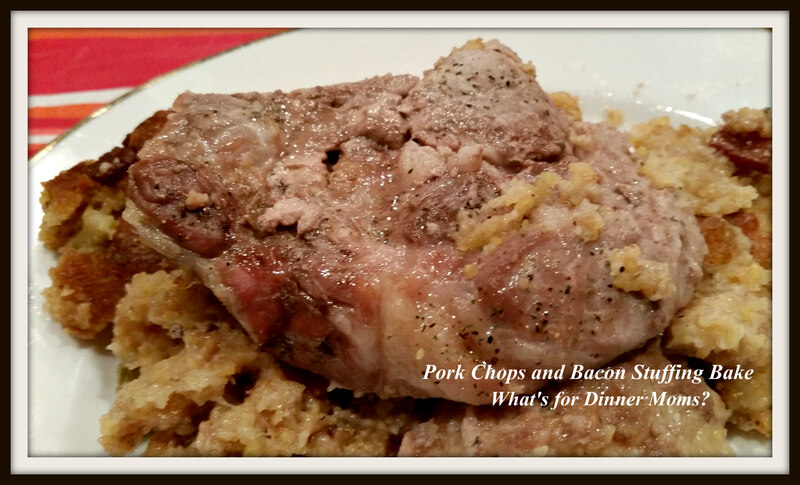 Pork Chop and Bacon Stuffing Bake – What's for Dinner Moms? We are coming to the end of our summer. The air at night is cooler. The skies are getting darker earlier and soon the kids will return to school. Where did our summer go? We had tons of fun this summer and now we are paying for it, literally. We are getting to the bottom of the cupboards and freezer eating out of them. This dinner was a bit different for us. Normally, I make my stuffing with Italian sausage but since we don’t have any I substituted bacon. Now I know you can substitute different ingredients in stuffing but I have always done it the same way. We liked it so why bother changing it? Oh. My. Yummy. I wasn’t sure how the kids would like it but I forgot. It is bacon! Plus I usually cook the meat and stuffing separately. Why? I don’t know. All that good flavor coming off the meat soaks into the stuffing too. The stuffing had great flavor from the bacon and the pork chops being cooked on top of it. It was super smushy, which we like. If you like your dressing a bit firmer uncover it sooner and use a bit less liquid in the dish. You can change-up the stuffing by adding in your favorite mix-ins such as carrots, mushrooms, even peppers. I stuck to our old stand-by of onions and celery. I served this with a green salad and green beans to complete our meal. Preheat oven to 350 degrees. Prepare a 13″ x 9″ casserole dish by spraying with non-stick spray. Pat dry the pork chops and sprinkle both sides with Nature’s Seasonings. Set aside. In a saucepan melt the butter and saute the onions and celery for 5 minutes. Add the chicken stock to warm it. Stir in stuffing mix, bacon and bacon fat. Mix until all the stuffing mix is moist. Taste and adjust seasoning as necessary. Place stuffing in bottom of casserole dish. Lay the pork chops over the stuffing. Cover dish with aluminum foil and bake for 15 minutes. Remove foil and continue baking for 10-15 minutes until pork is cooked through (depending on thickness of meat). Remove and let sit for 3 minutes before serving. It’s pork chops AND bacon! Lol. My family was in heaven. When I turned thirty I thought I had a blood clot and so went to the doc. No blood clot, but they did say I had the cholesterol of a 60 year old man with life long terrible habits, etc. haha, I was like, gee…thx. Wow! Heredity can be a huge part of that. I thank my parents daily. Ya my dad died at 40 of it, so it came as absolutely no surprise to me. Ooo, so sorry. So, leaves, twigs and berries plus a statin? Understand. Summer is coming to an end! First day of school for us! Nice one Marci! Thank you! We have one week left. Too short of a summer. You come up with the most creative dinner ideas, this looks fabulous! School starts here after Labor Day, Thursday I think for my senior daughter. Thank you! We start Tuesday and I am dreading it. I have a junior and a. 8th grader. I LOVE Italian sausage in my stuffing. I usually chop up some green apples and throw it in there as well. Bacon sounds like a good substitute, though! I was surprised that it tasted as good as it did. Of course we love bacon! Thank you. It was much better than I thought it would be. I was worried about being too salty but everyone liked it.